The Marietta Cast Aluminum 5 Piece Outdoor Dining Set with Square Table by Great Deal Furniture is an elegant, great value dining set that features a compact, 39-inch dining table, and which comfortably seats four guests in its spacious armchairs — letting you enjoy hours of conversation over al fresco lunches, coffees or evening drinks, whilst saving space on your patio, deck or balcony. 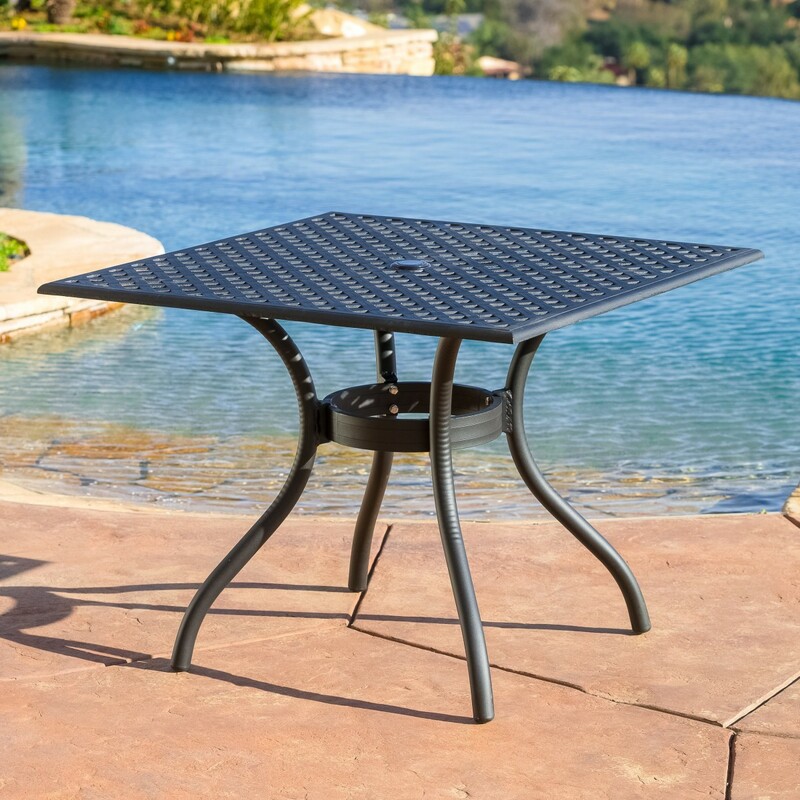 Constructed with sturdy, powder-coated, cast aluminum metal which will not rust (as it contains no iron), the Marietta Cast Aluminum 5 Piece Outdoor Dining Set with Square Table has a beautiful, black sand finish — offering a sophisticated, yet neutral tone that’ll match any existing furniture, and features gently-sloped armchair seats that are comfortable with or without cushions. 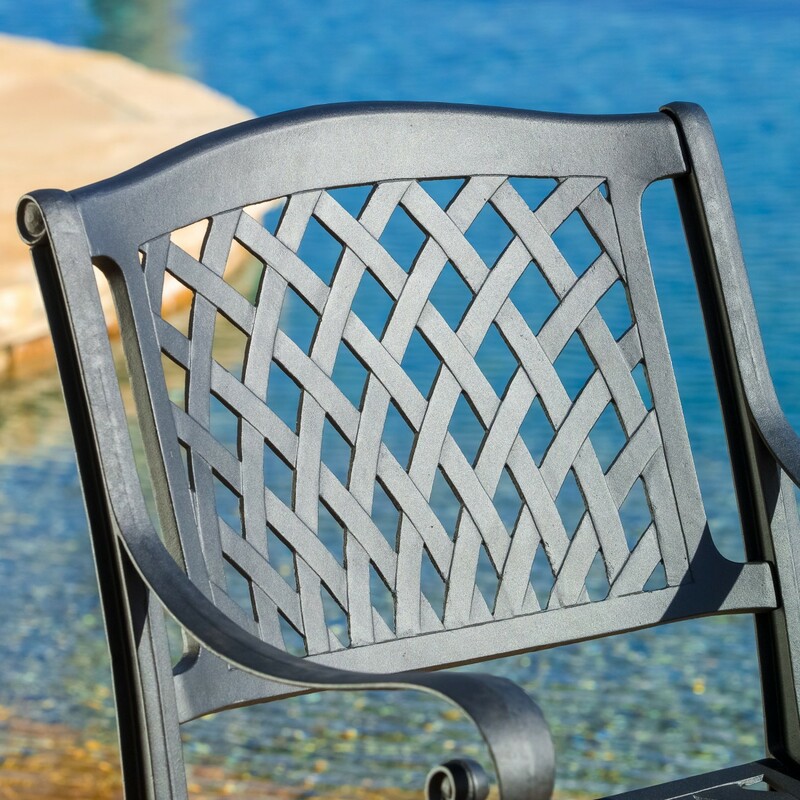 Featuring an elegant, outwardly-curving, latticework pattern on the chair seats and backs (which is reminiscent of long blades of grass), the Marietta Cast Aluminum 5 Piece Outdoor Dining Set also features a handsome dining table that provides a nice contrast — with its strong, straight latticework on the table top, bolstered by curved legs that tie together the set’s overall design. 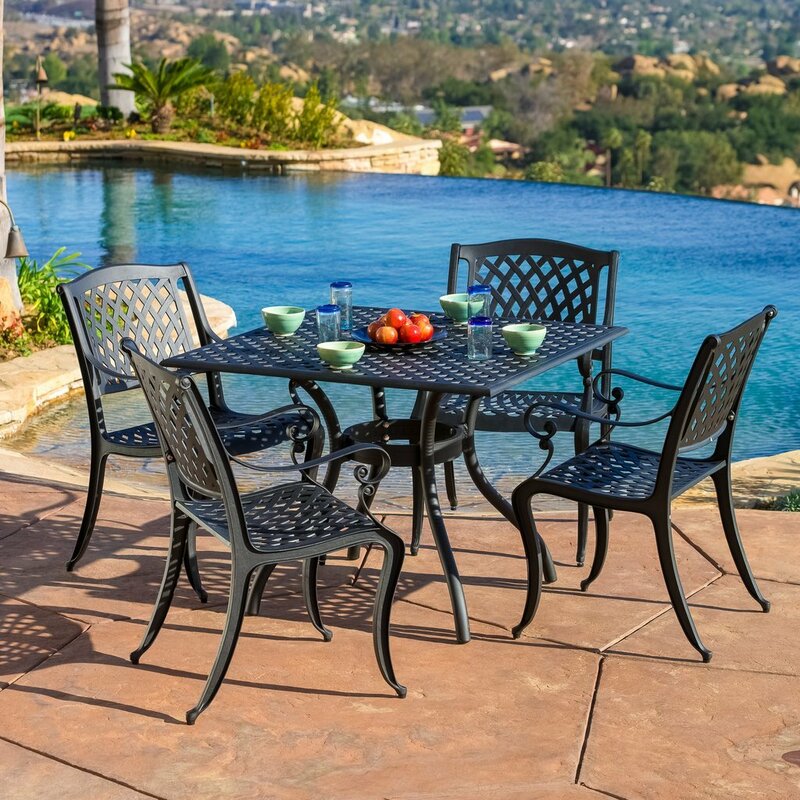 Similar to the Marietta 7 piece dining set, with the same generously-sized armchairs, but with a much more compact, 39-inch dining table, the Marietta Cast Aluminum 5 Piece Outdoor Dining Set is ideal for smaller spaces such as modestly-sized patios, porches and decks, or even balconies — letting you enjoy outdoor dining for up to four people, without sacrificing on comfort. 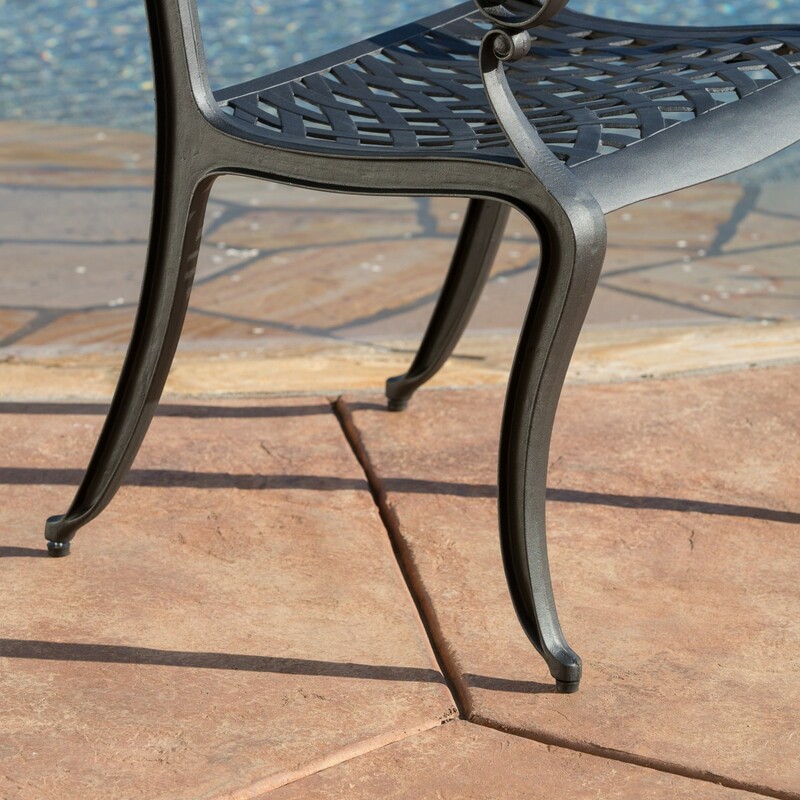 Including adjustable, threaded levelers on each chair leg, which protect your patio or deck from marks and scratches, balance out any wobbles on uneven surfaces, and make the chairs easy to move around, the Marietta Cast Aluminum 5 Piece Outdoor Dining Set with Square Table will make an elegant and practical addition to your outdoor space, that is sure to attract many compliments from friends and neighbors. 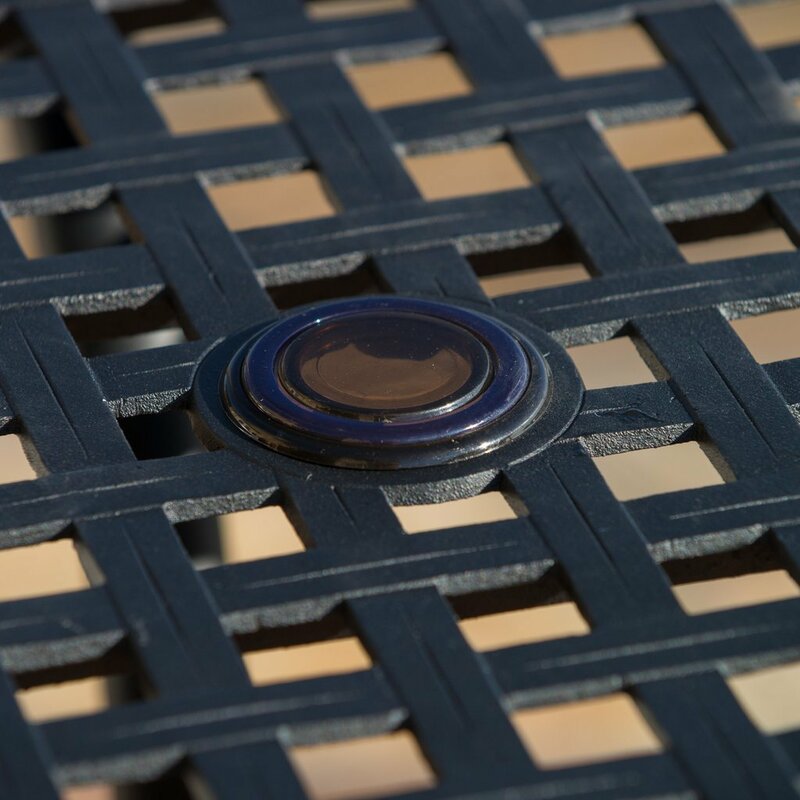 Including a standard umbrella hole for a bit of shade on brilliantly sunny days, and an umbrella hole cover, for when it’s not in use, the Marietta Cast Aluminum 5 Piece Outdoor Dining Set with Square Table is fully equipped to help you get the most out of your outdoor space, and start enjoying the warmer weather with family and friends. With easy assembly (just attach all the pieces with the included nuts/bolts/washers), the Marietta Cast Aluminum 5 Piece Outdoor Dining Set with Square Table has a completely flat table top that is safe for wine glasses, includes tools and instructions, and is a best seller over at Amazon.com (rated 4.6 out of 5 stars from 42 customer reviews) with FREE shipping. Click to see current price.